Metta World Peace is at it again. Last Sunday he threw an elbow at Oklahoma City’s James Harden. This incident comes at the worst possible time, as the Lakers will miss him for 6 games in the playoffs. Also, he was playing so well, like the young Ron Artest used to play. It is just unfortunate that he chooses to snap like that, because he plays so well when his head is screwed on right. But sometimes a screw comes loose… He is not new to multi-game suspensions, though. If you watch basketball, then I’m sure you remember the Malice at the Palace when he fought a fan in the stands an got a lengthy 86-game suspension. 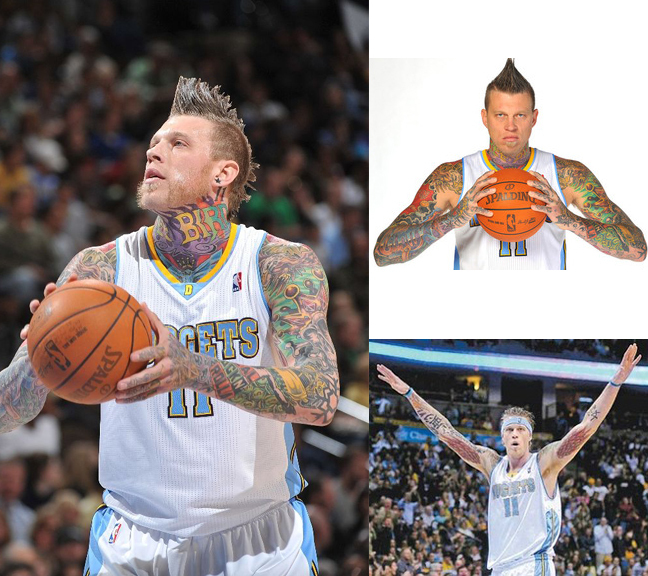 Also in 2007, he was charged with a seven-game suspension for his no-contest plea on a domestic violence charge. He can be such a great team player when he chooses to, and the Lakers and all of their fans hope he continues to choose to. Yesterday my mouse pad arrived from Amazon. I got a Magic Mouse for Christmas, but the surface of my desk was not smooth enough for it, so I ordered a mouse pad so I could use it properly. I ordered the wrong mouse pad. It is about the same size of the screen of my 13″ Macbook. I guess I need to pay more attention to the dimensions next time.. 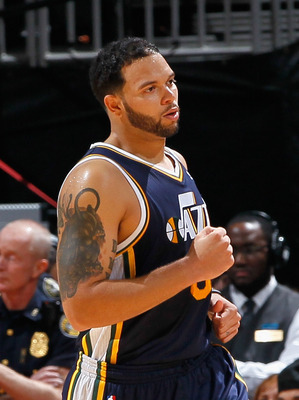 In the NBA, it is rare to see these young and affluent male athletes without tattoos up and down their bodies. 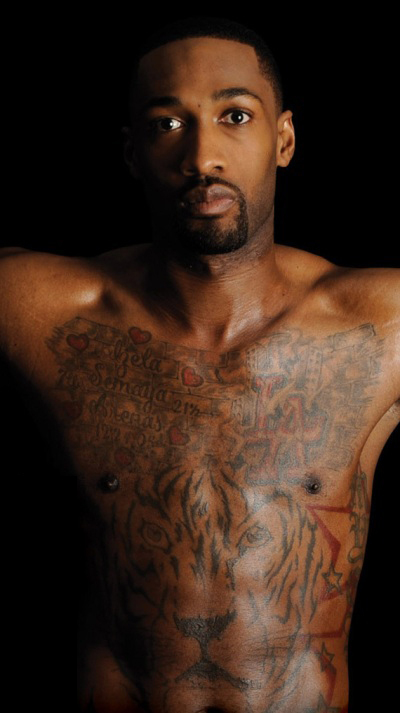 Most players have one or no tats while others can have obscene amounts all over their bodies. The list below is a list of ACTIVE players only, otherwise Dennis Rodman would take an easy first. Here they are, starting at number 10. 10. Deron William’s tattoo of a panther looks like a black blob from a distance, which is why he’s starting us off at number 10. 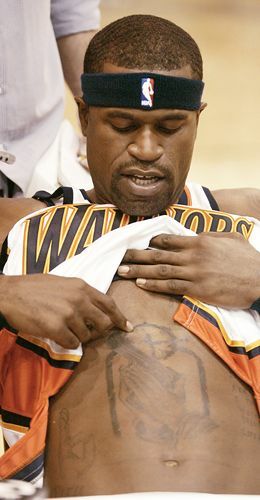 Stephen Jackson has two hands clasped together to pray, but in between his the hands are a gun. What a role model! 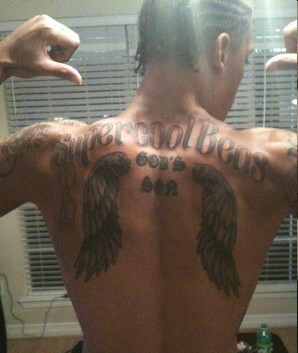 Michael Beasley had this inked, saying “Super Cool Beas” and “God’s Son” Every time I see it, I am quick to assume that it says Super Cool Beans, but it doesn’t and then I am quickly disappointed. Kenyon Martin, Kenyon Martin, Kenyon Martin… He must’ve been drunk when he decided that he wanted a pair of red lips on his neck, because that’s absolutely absurd. 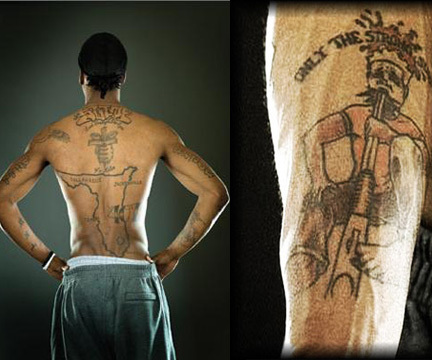 Why Marquis Daniels or anybody would want this permanently on their body is insane. The tattoo on the right says “Only The Strong Survive”, but the image below is a man blowing his head off. Just crazy. 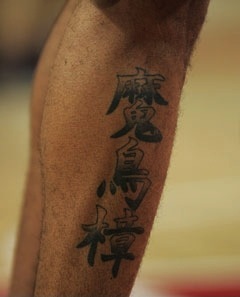 Chinese characters are usually normal tattoos, but not in Shawn Marion’s case. He got these characters because he thought they meant “The Matrix” which is his nickname. But they actually mean “Demon Bird Moth Balls”. 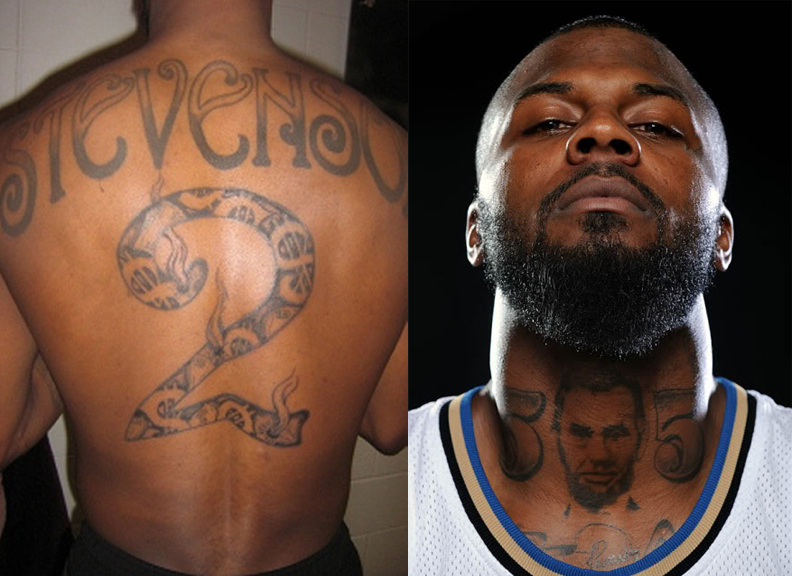 Both of DeShawn Stevenson’s tattoos are ridiculous. The first one, on his back, is his name with his jersey number. The tattoo on the right is why he gets this number 3 spot. It is a picture of our 16th president, Abraham Lincoln. Why the fives around him you ask? It’s because his friends couldn’t recognize the man in the middle, so he put the fives around him so they could recognize Mr. Lincoln. 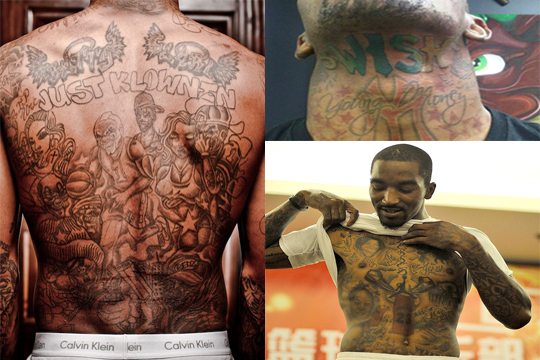 J.R. Smith is one of the most inked up players in the NBA. It is just sad that someone would want all of these images up and down their body. Played by Jaleel White, Steve Urkel was a character on Family Matters in the 80’s and 90’s. Jaleel White is one of the most underrated actors, and his roles in the ABC sitcoms showcase his talent to make people laugh out loud. Here’s a video of Steve Urkel from Full House. Skip to 0:34 for Urkel. 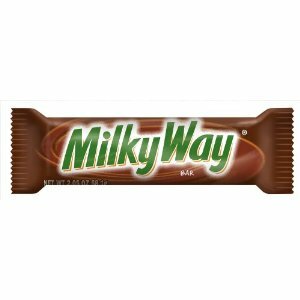 Milkyways are some of the most mediocre candy bars on the market today. When there is such a wide variety of candy bars available, why buy a milky way? It lacks flavor and when you bite into a milkyway, you think to yourself, why didn’t I buy a Reese’s, Twix, MnM’s, snickers, butterfinger, or any other candybar instead of a milkyway. 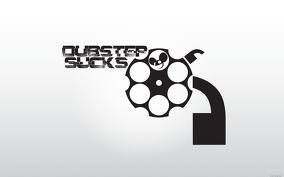 Dubstep is a genre of electronic dance music that takes little to no skill to make. Some people like it, some don’t, but I’d rather listen to music where the artist has real talent. I’ll listen to some dubstep, but most of it is just plain boring. Below is a video made by the comedic genius Jimmy Tatro that displays how stupid dubstep really is. Mondays have got to be the worst day of the week. Whether you work or go to school (which is the majority of the population), Mondays are the beginning of the school/work week and it’s right after the weekend. 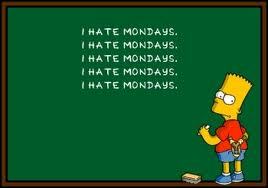 There’s even been a scientific study proving that mondays are the worst day of the week.